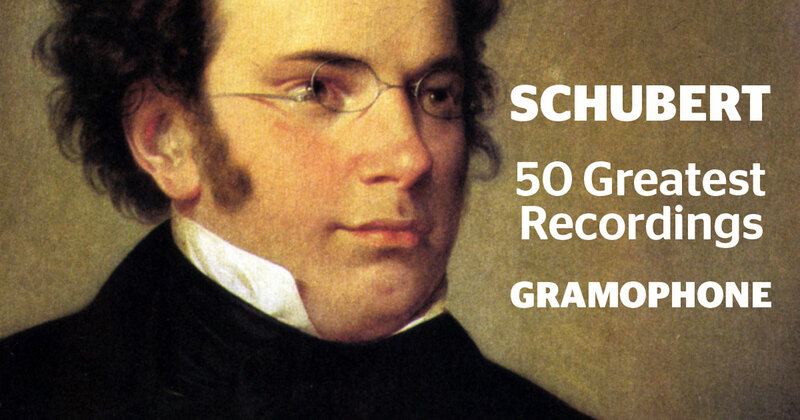 A warm welcome to Gramophone's guide to the 50 greatest Schubert recordings, which now joins our similar guides to the music of Mozart, Beethoven, Bach, Chopin and Handel. As before, we've focused on Gramophone Award-winning albums, Recordings of the Month, Editor's Choice discs and legendary earlier recordings from the likes of Artur Schnabel, Dietrich Fischer-Dieskau, Paul Lewis, Bryn Terfel, Ian Bostridge, Karl Böhm and many more. We have tried to give a recommendation for every major work and we have included, where possible, the complete original Gramophone reviews, which are drawn from Gramophone's Reviews Database of more than 45,000 reviews. To find out more about subscribing to the Database, visit: gramophone.co.uk/subscribe. The list begins with orchestral works, then moves through chamber and instrumental, and finishes with vocal. All of these lists are, of course, subjective, but every recording here has received the approval of Gramophone's critics and are artistic and musical benchmarks. So if you want to hear Schubert performance at its best, this list is the perfect place to start. These are marvellous performances: vibrant, clear, characterful and effortlessly well played. The recordings, too, still seem new-minted, even the Ninth, the first of the symphonies to be recorded. The Berliners’ art is the art that disguises art. Böhm never feels the need to do anything clever but just quietly sees to it that this superb orchestra plays at its best. His way with the two late symphonies is, in fact, highly sophisticated. The Unfinished begins in what seems to be a leisurely fashion but his performance of the first movement catches Schubert’s mix of lyricism and high drama with extraordinary acuity. Conversely, the second movement seems swift but brings the work full circle, with an equally extraordinary sense of calm and catharsis in the final pages. The celebrated 1963 Ninth out-Furtwänglers Furtwängler in the myriad means it uses within a single grand design to capture the symphony’s sense of danger and derring-do in addition to its lyricism, nobility and earthy Austrian charm. In the early symphonies, Böhm’s approach is simpler-seeming and more direct. Rhythms are so finely propelled, the pulse so effortlessly sustained, the music always lands on its feet. The zest comes from the stylish Berlin string-­playing; melodically, it’s the woodwinds (every one a Lieder singer) who catch the beauty of Schubert’s melodies and the skirl of the attendant descants. You won’t find yourself tiring of Böhm’s approach; he doesn’t give in to irritating idiosyncrasies (à la Harnoncourt), but ensures that the Schubertian stream is always clear to the ear and sweet to the taste. Marriner's Schubert is light on its feet, full of sprung rhythms and gracefully=turned phrases. The early symphonies are a sheer delight in this cycle with some glorious playing by the Academy of St Martin in the Fields. The later, great works like the Unfinished and the Great C major are also very appealing, with beautifully judged tempi and some wonderfully vivacious playing by these virtuoso musicians. In this repertoire, the competition tends to be from large symphony orchestras - BPO and Boöhm, Royal Concertgebouw and Harnoncourt, the NDRSO and Wand, to name three of the finest cycles - but Marriner's set can be confidently recommended if you respond to a more agile, 'modern' (though not 'authentic') approach. Beecham was well into his seventies when he made these recordings with the Royal Philharmonic, the orchestra he had founded in 1946. His lightness of touch, his delight in the beauty of the sound he was summoning, the directness of his approach to melody and his general high spirits will all dominate our memory of these performances. But, listening again, we may be reminded that Beecham could equally well dig deep into the darker moments of these works. Schubert’s elation was rarely untroubled and the joy is often compounded by its contrast with pathos – Beecham had that balance off to a T. It should be noted that he doesn’t take all the marked repeats and he doctored some passages he considered over-repetitive. However, these recordings may also serve as a reminder of the wonderful heights of musicianship that his players achieved, as in the Trio of the Third. This is good. Very good. Acclaim and the Pavel Haas Quartet are familiar bedfellows – after all, they did win Gramophone’s Record of the Year for their Dvořák two years ago. But this is their first recording that really steps into a crowded marketplace. They represent the best qualities of the Czech tradition – warmth, sonorousness, individuality, intensity; but what’s striking here is their fearless risk-taking, their fervency and the absolute confidence with which they propel you through these two masterpieces. In the Quintet they have the perfect partner in cellist Danjulo Ishizaka – and there’s no sense of a quartet plus one, which hampered the Takács Quartet’s recent reading. Their tempi are unfailingly right to the extent that comparisons, for once, seem almost irrelevant. And the slow movement of the Quintet is aching but never emotes superficially; the way the players withdraw the sound at its close is absolutely mesmerising. The Belcea rein in the emotions to a greater degree (compare them at around nine minutes into this movement) but the Pavel Haas – with slightly more dragging, vulnerable phrasing from the first violin – are insanely memorable. They also judge transitions beautifully so that the two works unfold in a completely natural way: just sample the finale of the Quintet, at the point where the second idea, with its slightly wincing Viennese gaiety, gradually yields to the return of the troubled opening idea. In the Quartet, too, there is much to admire: in the spectral closing minutes of the first movement; or in the slow-movement variations, where you’re held rapt as the first violin and then the cello take centre stage, and the ricocheting rhythms of the following variation – which can sound like gunshots in some performances – display a delicacy and a sense of dance. The crazed tarantella that closes the quartet is a tour de force, raw, visceral and with an emotional immediacy that is almost unbearable. Such is the intensity of the playing that by the end of the disc you, too, are quite exhausted. But that’s perhaps how it should be. Will these highly personal interpretations stand the test of time as effectively as the slightly cooler readings from the Belcea and, in Death and the Maiden, the Takács? From this proximity it’s impossible to say, but I’d say the odds are pretty good. By following Boccherini in using two cellos instead of two violas for his String Quintet, Schubert increased the potential for greater textural contrast. Moreover, the dichotomy between the tragic perspective and Viennese gaiety in the Quintet, so evident in much of Schubert’s greatest music, generates an especially potent dramatic force. The Hagen Quartet’s performance of the first movement, which presents remarkably clear textural detail, is broad and expansive. The Hagen include the exposition repeat in a movement that lasts almost 20 minutes. Perhaps as a consequence, they play the Adagio second movement at an unusually fast tempo. However, through breathtaking dynamic control in the first section, passionate intensity in the second, and engaging spontaneity of the ornamentation in the final section, the Hagen achieve an expression that’s powerfully compelling. The second half of the Quintet is often treated as a period of emotional relief from the profound concentration of the first two movements. Startlingly, the Hagen maintain the tension with violent textural and dynamic contrast in the Scherzo, and distinctively varied registral sonority in the Trio. The finale, in which the Hagen effectively balance the music’s charming Hungarian flavour with its more sinister touches, provides an arresting conclusion. The Hagen’s account of Beethoven’s Grosse Fuge is polished and sensitive, and it vividly conveys the difference between Beethoven’s and Schubert’s compositional means. The Hagen’s is an outstanding disc, in which exceptional performances, that challenge the finest alternatives, are complemented by superb recording. This should have an in-built fail-safe against hasty consumption, in that the interpretative ingredients are so rich, varied and unpredictable that to experience it all at once is to invite mental and emotional exhaustion. Casals is the linchpin. A charismatic presence, he embraces everything with the passion of a devoted horticulturist tending his most precious flowers, and that his love extended beyond the realms of music to mankind itself surely enriched his art even further. The most celebrated Prades recording ever is still the Stern/Casals/Tortelier reading of the Quintet, a masterful traversal graced with elastic tempi, songful phrasing, appropriate rhetorical emphases (especially in the first and second movements) and fabulous string-playing. The coupling is a ‘first release’ of Schubert’s Fifth Symphony, recorded in 1953 – a warm, keenly inflected performance, jaunty in the outer movements and with an adoring, broadly paced Adagio. One presumes that it has been held from previous view only because of a few minor executant mishaps. It’s certainly well worth hearing. The transfer of the Quintet reveals itself as marginally warmer but occasionally less well-focused than previous incarnations. Still, the original was no sonic blockbuster to start with, but this shouldn’t deter you from hearing this disc. A memorable account of the Trout Quintet. This group may not project the warmth and bonhomie of the famous Curzon/Boskovsky recording (Decca), nor does it have the searching quality of the performance led by Alfred Brendel (Philips), but for verve and refinement it’s hard to beat. The happy, carefree nature of the music is captured perfectly on a beautifully clear recording; it’s especially notable how every detail of the double bass’s very spirited contribution is clearly heard yet with no sense that Alois Posch is ‘bringing out’ his part. Especially enjoyable is the Scherzo – a fast tempo but finely poised, and with a subtle, effective relaxation of the Trio – and the Variations. In Var 2 Renaud Capuçon’s figuration is so delicate that the viola melody can create a particularly strong expressive effect, and the following variation is just as magical – Frank Braley’s demisemiquavers are quite brilliant, with a lovely, silvery tone, and the bass melody has, for once, nothing elephantine about it. The elaborate, showy set of variations on ‘Trockne Blumen’ from Die schöne Müllerin, dating from 1824, is an unhackneyed choice of filler. Played with the precision and delicacy that Capuçon and Braley bring to it, it is highly effective, though with only occasional touches of the melancholy we expect in late Schubert. After this extravagant music, the touching simplicity of the song arrangement is the more striking. This Trout must surely be one of the very best versions of this much-recorded work. You get the impression that here was an occasion when everything ‘clicked’, giving the playing a friendly, relaxed feeling that’s just right for this carefree piece. Zacharias has the knack of making even the simplest phrase sound expressive, and the strings, without any exaggeration, produce the most beautiful tonal shadings. All five players, too, have an impressive sense of line; the phrasing and points of emphasis are balanced so that Schubert’s expansive designs are projected compellingly. If the Trout shows a Schubertian spaciousness, his one completed String Trio is unusually compact. Another distinguished feature is the florid, Spohr-like elegance of much of the violin-writing – Andreas Seidel is splendidly stylish and confident. This is another very fine performance, emphasising the predominating gentle lyricism but with plenty of vigour and panache when required. The String Trio fragment, less than two minutes, continues the same ‘let’s hear everything’ approach; it’s a sketch for what subsequently became the comparatively familiar B flat Quartet, D112. particularly in the slow movements. Indeed, the players’ progress through the wonderful set of variations in the Andante con moto, which reveals the Death and the Maiden Quartet’s association with the famous Schubert song of that name, has unforgettable intensity. The comparable Andante of No 13, with its lovely Rosamunde theme – which is approached here in a relaxed, leisurely manner – is held together with a similar (almost imperceptible) sureness of touch. When this work was originally issued, the first-movement exposition repeat was cut in order to get the quartet complete on to a single LP side. Here it has been restored. Finest of all is the great G major Quartet, a work of epic scale. The first movement alone runs to nearly 23 minutes and the players’ masterly grip over the many incidents that make up the Allegro molto moderato is effortless. For an encore we’re given the Quartettsatz, a piece on a smaller scale, but here presented with a comparable hushed intensity of feeling. This, like the Death and the Maiden, was recorded in 1965 and the textures are leaner than on the others, with a fractional edge on fortissimos. Nevertheless, the ear soon adjusts when the playing is as remarkable as this. The other recordings have more body and a fine presence. The CD transfers throughout are excellent. With their Decca Beethoven cycle, the Takács Quartet set a modern-day benchmark. Now, with a new record company and a replacement viola player, things look set for them to do the same for Schubert’s two most popular string quartets. These works were written in 1824, a year of despondency for Schubert, who was ill and clearly felt he was living under the shadow of death. Whereas in the Rosamunde, the underlying feeling is a tearful nostalgia, in Death and the Maiden there’s a black despair that at times gives way to anger. The Takács have the ability to make you believe that there’s no other possible way the music should go and the strength to overturn preconceptions that comes only with the greatest performers. Tempi are invariably apt – the opening of the Rosamunde is wonderfully judged. They also have a way of revealing detail that you’d never previously noticed – in the Allegro of D810, Schubert’s sighing figure in the viola is here poignantly brought out. But though there’s plenty of humanity in these recordings, there’s nothing sentimental about the playing; they make Schubert sound symphonic, and a sense of drama and tensile strength underlines everything, even a movement as luscious as the Andante of the Rosamunde Quartet, which is based on the theme that gives this quartet its name. The recording captures the quartets vividly and realistically and Misha Donat’s notes are erudite and stylish.